Sunshine illuminates the large, spacious room, while birds sing a familiar tune in the courtyard. The printer hums, as my finger presses down repeatedly on my mouse. One by one my responsibilities stack on top of each other, waiting to be assigned priority. My eyes are drawn towards the green arrow as it weaves through the map on my screen. My cheeks curve upward in response; it’s on time. Taking a sip of coffee, I flick the wheel of the mouse. I scan my inbox looking for anything that pertains to today’s date, but my attention is quickly drawn toward the small, bright yellow squares decorating the monitor. I almost forgot. I lift the receiver, dial a familiar number, and wait for the dispatcher. “Hi Payton, how many hotels to pick keys up at today?” the voice asks. I lay the phone back in its cradle, and open up a recent message titled ‘Requirements,’ which reads: ‘Hello Kamloops, We have two upgrades from coach 1 to coach 4. Also, we need a ramp for a wheelchair bound guest in coach 3. That seems to be all for now. See you soon.’ As my pen glides across the crisp white paper, noting these requests, a cheerful tinkle welcomes my team entering through the station door. Without hesitation they walk over to the hotel lists, and begin to sort room keys into the order in which the guests are seated onboard. The phone on my desk buzzes. “Hi this is Payton,” I answer. “What’s it looking like today?” The man inquires. Hanging up the phone, I walk across the office to the supply cupboard, removing fifteen numbered white blocks. I place them into the forest green wagon and head outside to the sun-scorched platform. I start at the top of the black asphalt and work my way down toward the bright red bridge. Starting with number one, I place the white blocks in particular locations, so they will line up with each arriving vestibule. Back at my desk I see the neon green arrow on the map: It’s almost here. As I step back outside, I can feel the pavement rumble beneath my feet. I take a deep breath, inhaling the fresh scent of sage. 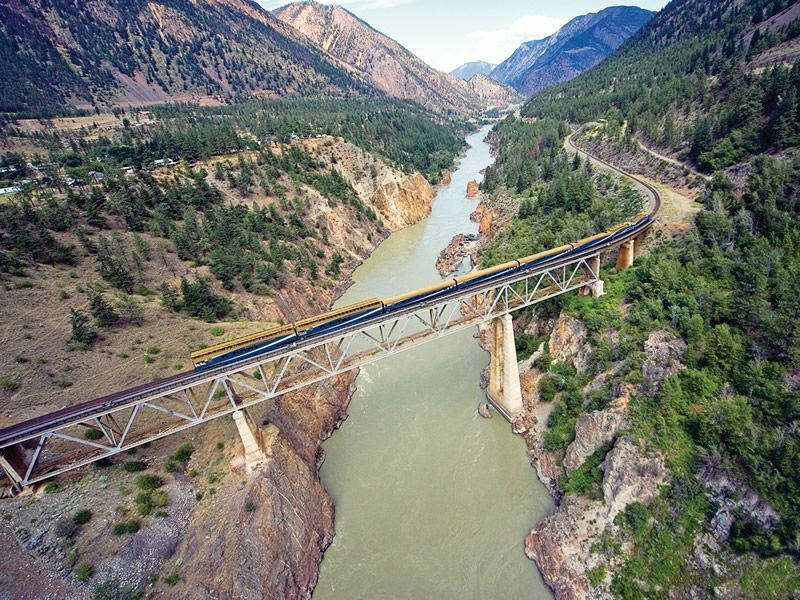 Crossing over the historic Thompson River, the locomotive roars, echoing through the valley. As my eyes spot the gold, mountain peak logo, my heart begins to beat of its own volition. The whistle blows. It’s here! Article written by Kamloops Assistant Station Manager Payton Commazzetto.